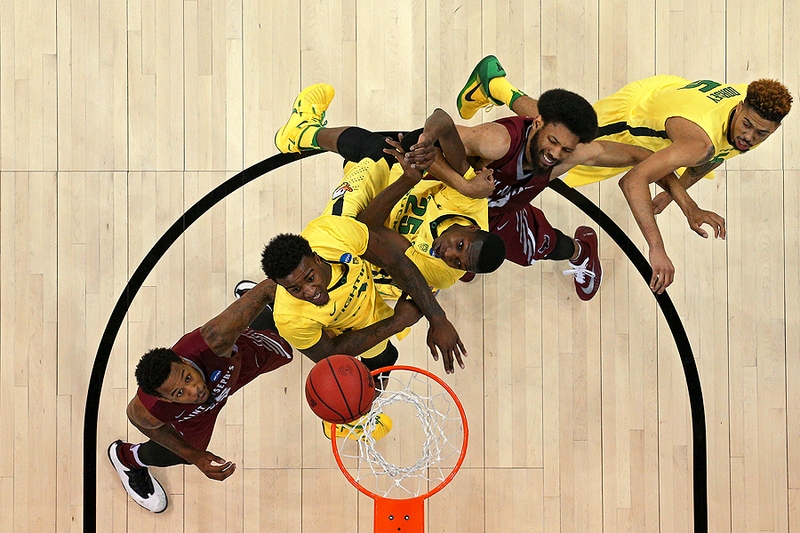 "Isaiah Miles #15 of the Saint Joseph's Hawks, Jordan Bell #1 of the Oregon Ducks, Chris Boucher #25 of the Oregon Ducks, DeAndre Bembry #43 of the Saint Joseph's Hawks, and Tyler Dorsey #5 of the Oregon Ducks, battle for a rebound in the second half during the second round of the 2016 NCAA Men's Basketball Tournament at Spokane Veterans Memorial Arena on March 20, 2016 in Spokane, Washington." Basketball can be very similar as ice hockey - being up close and personal on the court or ice doesn't always translate to the cleanest imagery. What I mean is that advertisements can quickly distract viewers eyes. While each venue is different, some have cleaner backgrounds than others, setting up a remote camera is one way to clean up a frame. Most if not all of the basketball I cover locally doesn't allow for clean angles for remote cameras. So when I jetted west, I knew I'd bring my remote gear to document the first and second round of the 2016 NCAA Men's Basketball Tournament at Spokane Veterans Memorial Arena. I had no idea what possibilities I'd have, and without bringing the right gear, I would have never been able to find out otherwise. After two days of basketball and six games, the above was my favorite remote image. Basically firing blindly from the opposite end of the court, the players interlocking and battling for a rebound communicated the fierce competition of March Madness.